A novel, this time, rather than a ‘how to’ or garden diary style of book. I love this book and have read it many times. Elizabeth Buchan is the daughter of gardening writer Ursula Buchan so in ways it is no great surprise that at some point her writing would weave gardens and gardening into the story. Set in a rural England, after the end of the Great War it tells the story of a bride, newly married into a close knit family, and as a result of a variety of obstacles, never quite fitting in. Taking over the somewhat shabby and run down ‘big house’ she transforms it, and then, still lonely and left out she turns her attentions to the ruined garden and for me this part of the book really makes it. The garden restoration is told in loving detail, gardeners will recognise the plants selected, and want to add them to their own collections, you can smell the roses and lilies. It is an easy read, and from my own experience I found myself totally absorbed in the story, coming to the end with a real sense of loss. A great book for those days when it is too wet to garden, or when you overdid it digging the day before and need a bit of a break, but can’t quite shut the garden out. 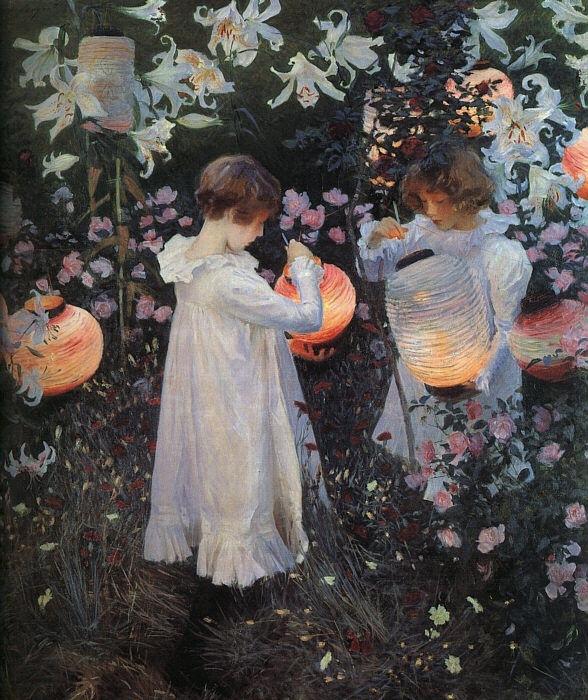 The image in this post is the exquisite ‘Carnation, Lily, Lily, Rose’ by John Singer Sargent. The original can be found in Tate Britain and is the painting I always make a point of visiting whenever I am there; it is one of my favourites.